DearMYRTLE's Genealogy Blog: Will Pinterest replace blogs? From the "believe it or not" department, last week I heard the mid-day talk show hosts on KLS radio (Salt Lake) suggest the possibility that Pinterest will replace blogs. Clearly this stance demonstrates a decided lack of understanding when comparing the two free web tools. Pinterest is used to 'pin an interesting" visual reminder of a web page to one of your personal online bulletin board for ease in finding that interesting page later. It's a graphic 'bookmark' option, decidedly more interesting than a mere list of sites in text format as we find in typical web browser bookmarks. By contrast, a blog is a method of 'getting the word out' via the internet about your topic of interest, in my case, it's genealogy. The KSL talk show hosts are completely missing the point that Pinterest cannot replace blogs, UNLESS there is never to be new content added. One may adds add previously-created content to his Pinterest board, but you cannot create new things to pin to the board using Pinterest without first publishing a web page, blogging, adding clips to our YouTube channel, etc. - each requiring the use of tools other than Pinterest. 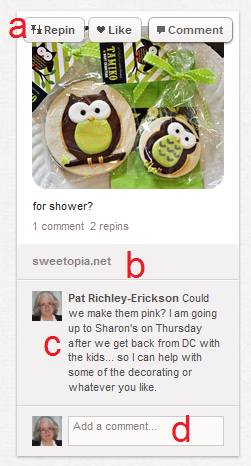 At "a" there is a row of buttons to permit one to repin, like and comment. At "b" we see the abbreviated URL of the original picture, hopefully with more details. At "c" one may read a comment I posted. At "d" one may add an additional comment if he is logged in to Pinterest. If you click on the owl picture on Stacey's Pinterest board above, you are eventually taken to the original post titled How to Make Decorated Owl Cookies by Sweetopia.com. It was from this recipe that Ol' Myrt here made these owl cookies as "take homes" for the baby shower attendees. Ol' Myrt here almost went cross-eyed making those tiny little green "V" marks, but it sure was fun. How do I install the "Pin It"" button? Pinterest provides a graphical reminder of websites one wishes to revist. Blogging shall continue to be an easy way to publish one's thoughts on the web. The radio hosts obviously lack some information here, either about blogs or pinterest. I tend to describe pinterest as a bookmarking site. It's a place to share content, not a place to create content.